Is This Expensive Spice Worth It? The Saffron Benefits Below Say Yes! Saffron benefits can't be overstated! Providing the delicate flavouring for a number of fragrant cuisines, and the vibrant colouring of a Buddhist monk’s robes, it's famous for imbuing whatever it touches with a strong golden yellow colour, and a savoury fresh flavour. Due to the painstaking process of harvesting the flower’s stigmas by hand, saffron spice can be a little expensive, but with so many culinary and medicinal qualities, I'd say it's worth that little bit extra. And remember, a little goes a long way! Native to Asia, its use spread all along the trade routes from Europe into China and the Far East where it was used to treat a number of medical conditions from fatigue to bringing mental clarity! Read more about the plant and its uses. 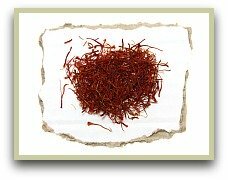 Saffron threads (stigma) contain the chemicals picrocin and safranal. These provide the pleasant hay-like flavour, while crocin adds the golden colour. It's these chemicals that are beneficial for your well-being. Today, the latest research from Italy focuses on the saffron benefits for your optical health. Initial findings show that the chemicals this spice contains may help protect and even help reverse the damage of macular degeneration in the eyes. In times gone by, particularly China and India, people used it for dyeing and staining clothes and fabrics. In fact, the yellow colour of a monk's robe used to come from saffron threads. Obviously this was quite costly, so in more recent times, the textile industry have turned to using the cheaper turmeric spice. Click to read more on the general uses. But unless you're into dyeing your own clothes, it's more than likely you prefer to enjoy the culinary saffron benefits. 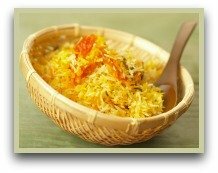 You'll find it widely used in food from India, Turkey and Central Asian. And it is the perfect addition to many traditional rice dishes. You'll find it used in many of the classic recipes: Spanish paella, Indian pilau and a Milanese risotto to name a few. If you want to try it out for yourself, you can try my simple rice recipe.